At some point, there was a Roll-N-Roaster Roll-N-Roaster in the East Village, by Webster Hall. I never got around to trying it and it closed. Still, the original (in Brooklyn) is still going strong after 35 years and several expansions, yet prices have remained the same. 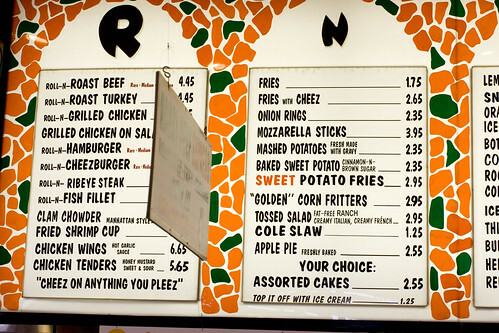 All readers know, I’m not a fan of fast food, but perhaps I would be if more fast food places operated like Roll-N-Roaster. There’s still no table service, and the place isn’t pretty, but the food is made fresh. 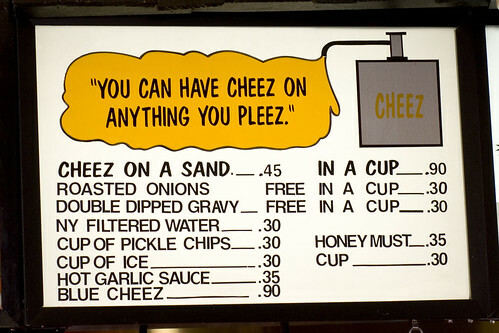 Plus, how could I not love a place that offers cheese on anything? 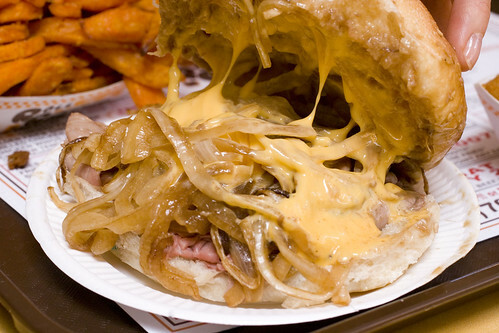 The roast beef is juicy, the roasted onions are free, and while cheez whiz is not my first choice of cheese, it works incredibly well on this Roast Beef Sandwich meets Philly Cheese Steak, that melts in your mouth. We were a bit upset that we got a medium-rare when we ordered rare, but I’m sure they would have changed it if we asked. Their sweet potato fries are crispier than average. The corn fritters are ridiculously hot (yes, that kind of stuff impresses me). It takes little effort to break the thin crunchy shell that releases the sweet, creamy, and chunky filling. Ooh, these are satisfying, and not at all oily. I can’t say I would drive all the way to Sheepshead Bay for Roll-N-Roaster, but I now wish they didn’t close that location in the city. posted by jessica	at 02:25 PM	Filed under American and New American, Restaurants. You can follow any responses to this entry through the RSS 2.0 feed. Both comments and pings are currently closed. I’ve been going to this location for years. The one in the city closed because it wasn’t as good and couldn’t sustain the crowds necessary for the rent. The food was mediocre at that one. I have to say, though it’s on the menu that you can get it rare/m.rare/etc., every time I’ve been, they don’t ask how I want my roast beef. The one in the city did ask that, however, but they got it wrong anyway. Just a curious point to note. Also, the chip fries are really good – and cheese on the side for dipping, yum. (The fries are like potato chip shape/size, but some are a lil thicker than others.) I totally love this place… especially before/after a movie at the UA nearby (which used to be better but now is too crowded). Oh everything looks so good. 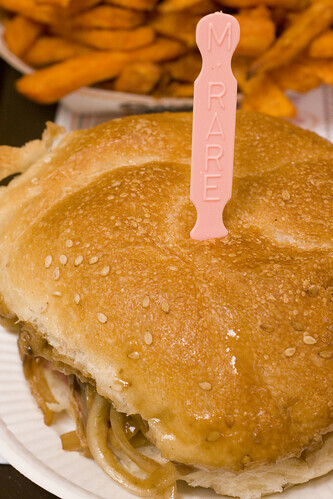 It’s already 2pm, I haven’t had lunch yet and I’m hearing the call of the carb! 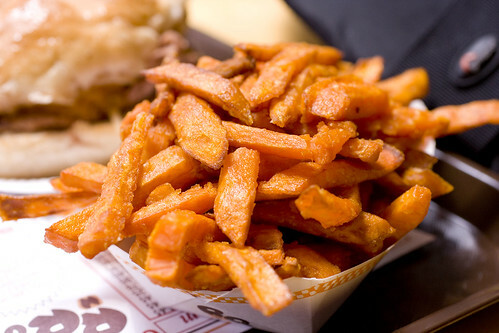 The sweet potato fries are sooo tempting! What makes this place great is more than the food- it’s a shared South Brooklyn experience. EVERYONE loves Roll n Roaster. It’s a passion that almost everyone can agree on. 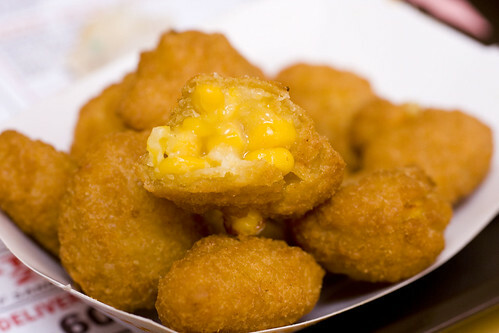 A corn fritter could be worth the drive. Or maybe just an overnight Fedex to LA. Wow–that stuff looks so unhealthy & so good! Known for the roast beef..but gotta try the fried shrimp cup and my favorite..the sweet potato with butter, cinnamon and brown sugar! the sweetpotatoe fries are gross in bklyn pizza sometimes burnt fries grat roastbeef good fish great lemonade watery.